Behind the Numbers: How Are the Caribou? 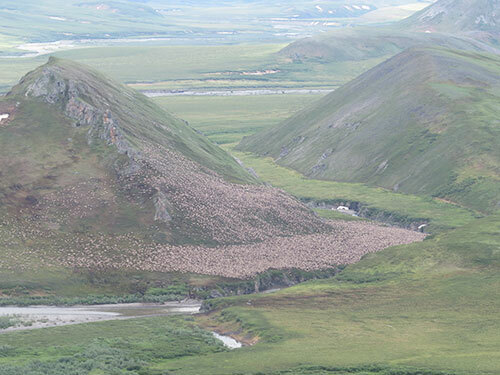 The summer of 2013 marks the first time all four caribou herds that calve on the North Slope were counted in one year. Unusually warm summer weather across the state and especially on the North Slope meant buggy days, and caribou grouped together for relief from insects. The conditions were so consistent across the North Slope (and even into Canada) that ADF&G biologists were able to take census photographs of the Western Arctic Herd (WAH), Teshekpuk Caribou Herd (TCH), Central Arctic Herd (CAH), and Porcupine Caribou Herd (PCH). The caribou herds were photographed during the summer, and staff counted the caribou in the photos in the fall and winter. Results range from good, to bad, to messy. The PCH was photographed on July 14, 2013. Caribou were widely distributed, with a large number in the Richardson Mountains in Canada, and the remainder in the eastern Brooks Range. The estimate for the PCH was over 197,000, which is the highest ever observed for that herd. For the WAH, the slow decline from 2003 to 2011 transitioned to a more rapid decline. Similarly, the TCH was estimated at approximately 32,000 caribou, which is also less than half of the highest count of 68,000 in 2008. Although the reasons behind the declines are not easily identified, poor calf production, poor calf survival, and spikes in adult female mortality are contributing to the declines in both herds. Poor nutrition appears to be playing a stronger role in the TCH than the WAH, based on differences in pregnancy rates and trends in calf and yearling weights. To the east, the population trajectory for the CAH is less certain. 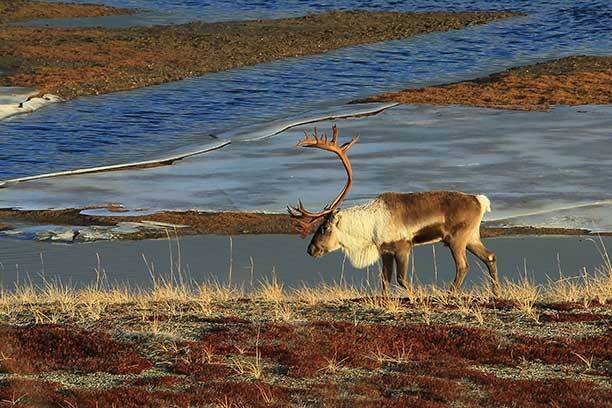 In July of 2013, over 70,000 caribou were counted, which is similar to their peak of 70,034 in 2010. Despite good numbers, ADF&G biologists are not confident about the trend of this herd, because some collared caribou from the PCH were present in the groups that were photographed during the CAH census. Caribou herds mix, especially during the fall and winter. Genetic studies show that of the four North Slope caribou herds, only the WAH and PCH, the western- and easternmost of the four herds, show genetic differentiation. This is not surprising considering that the ranges of these herds overlap during breeding season, or rut. In recent years the degree of mixing appears to be increasing, and many caribou that are mingled in the winter end up migrating with a different herd in spring. In the summer of 2013, almost 20 percent of the collared TCH wintered in parts of the WAH range, and were with the WAH during the WAH photocensus. Similarly, the 70,000 caribou that were counted during the CAH photocensus included ten PCH collars, which could represent as many as 20,000 caribou. How does Mixing affect Population Trends and Herd Management? Counting caribou can be difficult. In addition to the annual challenges of weather and logistics, mixing of herds has been problematic lately. As of last summer, in all four herds, there were a little over 500,000 caribou using the North Slope at some point in the year. That is still a lot of caribou, but far less than a decade ago. Despite the recent decline, the WAH is still large. Although its numbers were boosted by 5,000-6,000 caribou from the TCH, those few thousand caribou only represent about 3 percent of the total number of caribou counted in the WAH. That difference makes little or no difference in how this herd will be managed. The TCH is a much smaller herd, and a few thousand caribou is a much larger percentage of its total size. Biologists aren’t sure if the TCH caribou that mixed with the WAH will come back to the TCH, and it may be difficult to tell if they do. The number of caribou counted in the CAH was similar to the last count in 2010. 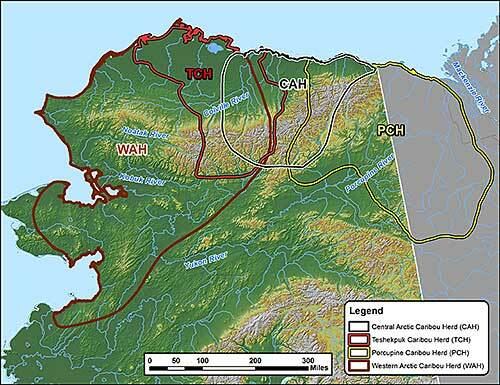 However, if the ten PHC collars that were found with the CAH mean that 20,000 caribou from the PCH were present during the count, then the CAH has declined by over 20 percent from the last count. It’s not as large a decline as the WAH or TCH, but certainly significant. Herd managers continue to watch this situation closely. During the early 2000s, the number of caribou summering on the North Slope peaked at over 700,000 animals, perhaps the highest number since at least the 1970s. At that time, it was relatively rare for caribou to mix or migrate with other herds, either permanently or temporarily. If the large number of caribou in the late 1990s and 2000s had a negative impact on their ranges through overgrazing, caribou may be searching for new areas, increasing the degree of mixing between herds. Perhaps mixing will decrease as herds become smaller, but for now it is a significant issue that affects estimates of caribou abundance. What is clear is that the overall number of caribou in at least two of the herds, the WAH and TCH, has declined dramatically and may continue to do so. Because of its continued large size and the high cost – in terms of staff time and money – required to census the WAH, the next scheduled attempt will be made in the summer of 2015. However, if the 2015 census shows that the WAH continues to rapidly decline, ADF&G will attempt to census this herd every year. Managers are unlikely to conduct another photocensus on the PCH until the summer of 2015, because that herd appears to be increasing and the 2013 photocensus was of high quality. ADF&G will attempt to photograph the CAH and TCH in July 2014 if conditions are favorable. ADF&G’s ability to count caribou in future surveys will be vastly improved with the use of new high resolution digital camera equipment. Estimating the population size or number in a herd of caribou often receives all the attention. However, it is not the only number that tells you how a population is doing. In addition to herd size, biologists use a combination of assessments to determine the status, trend, and direction of change in a population. One thing biologists look at carefully is the condition of caribou habitat. Alaska, barren-ground caribou, such as those of the WAH, prefer treeless tundra and mountains; however, they also use forested areas, especially during winter. Calving occurs in the northern foothills of the De Long Mountains and the herd uses the same area each year. Caribou eat lichen as a primary winter food source; however in the summer they eat their fill of nutrient-rich green grasses, sedges, willows and flowering plants. Habitat condition and available forage can influence migratory routes and areas where caribou choose to winter. Caribou eat lichens during winter and, if there are not enough lichens or other vegetation to support them, caribou may starve before making a long-distance trek to another area. The Bureau of Land Management (BLM) has documented changes in lichens vs. grasses and shrubs on WAH winter range, but the body condition of caribou suggests that these changes are not yet limiting the size of this herd. The body condition of caribou also provides important clues in understanding the health of a herd. Body condition is influenced by both the quantity and quality of food on its range. Biologists assess body condition through the thickness of fat on the rump, by looking at the fat present in bone marrow, and also by measuring weights of calves. Every three to five years, they also collect caribou for a veterinarian to do detailed laboratory tests to assess their health and condition. The combination of these studies indicates how habitat may be impacting caribou health and helps explain if herd size is increasing, remaining stable, or decreasing. Caribou from the WAH have generally maintained good body condition even after the current population decline began, and the proportion of skinny caribou during fall has even decreased during recent years. A North Slope caribou. Photo by Jim Dau. Calf: cow ratios indicate the number of calves in a population compared to the number of cows. When calf survival is low and recruitment into the herd doesn’t keep place with adult mortality, herd size will decrease. Current studies indicate that calf: cow ratios, as measured during the spring following their birth, are indeed declining. Adult cow mortality can strongly affect caribou population size and trend. Most cows probably produce only six or seven calves during their life, and many die before becoming reproductively mature. The proportion of young and old individuals in the herd can indicate whether a population is likely to increase or decline in the future. If many cows are dying at an old age and few young cows are being added to the population, herd size will likely go down. Studies indicate that the WAH adult cow mortality has gone up since the late 1990s. Observations on Traditional Ecological Knowledge (TEK) from local residents along with aerial observations by biologists and pilots, indicate that wolf and brown bear numbers may be up in many portions of the WAH range. Predation can greatly influence the survival of calves and adult caribou. If the herd falls below its Intensive Management objectives, ADF&G will assess with the BOG the feasibility of predator control activities as required by State Law. The bull: cow ratio is the number of bulls in a population compared to the number of cows. The Working Group, in consultation with State and Federal managers has suggested maintaining at least 40 bulls for every 100 cows to ensure there are adequate bulls in the population to breed with available cows, and to provide for harvests. Not having enough bulls in the population can lead to some cows being bred late. Late breeding results in calves that are born late. These late-born calves have less time to grow before winter, and may be less likely to survive the winter. Studies indicate that the bull: cow ratios have been declining since the early 1990s. What about hunters? Harvest records indicate that people who live within the range of the WAH have taken an average of approximately 14,000 caribou each year. Hunters who live outside the range of the WAH have taken an average of 600 animals per year. This is the reported harvest only -- there is likely some unreported harvest as well, bringing the harvest number higher. Hunter harvest can have a negative impact on a population in terms of overall numbers, and in terms of bull:cow ratios. Reducing harvests based on Working Group guidelines will become necessary to conserve the herd and prevent further declines. What Does all this Tell us about the WAH? We know that the overall trend for the WAH has been declining over the past decade. This decline is consistent with poor calf and adult cow survival at the end of each year. Combined with stable harvest levels, this decline may at least partly explain the decline in bulls. Even with caribou appearing in good body condition and calves being produced at high rates similar to previous years, the lack of surviving cows and calves coupled with harvests are contributing to the herd decline. Reducing harvests as recommended in the WAH Cooperative Management Plan are likely to become necessary to conserve the herd.